Since I wasn’t expecting an invite to Will and Kate’s wedding March seemed like the perfect time to take a trip across the pond to scope out the fashion scene, do some shopping and see friends. I won’t bore you with the details of our horrific first three days (my friend’s stolen carry-on bag, passport etc), at least the weather was gorgeous, the flowers were blooming and sadist that I am, I was happy to hear that NY had snow! But, back to business. Somehow I expected to see more fashion trendsetters on my daily outings. Instead the only so called trend that I noted was the fact that every other girl/woman was wearing black tights or leggings with or without cut off shorts, topped off with a t-shirt or skimpy tunic. That seems to be the new fashion standard. Also surprisingly, I didn’t see many stilettos or platform shoes (thank God), just casual flats or boots. Even the ubiquitous Birkin was practically a no-show, but I did see a number of other designer bags, mainly on the arms of other tourists. On the whole the men were better dressed, especially the businessmen with their scarves tossed over well fitted suits and highly polished shoes. Speaking of shoes, variations on the oxford turned up in every boutique I passed. Somehow I didn’t expect this style to continue right through spring/summer. 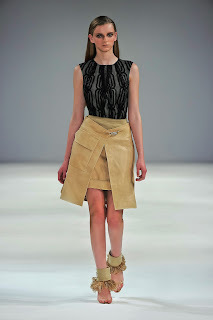 Some of my favorites included RUSSELL & BROMLEY’s selection in two-tone, leather/fabric combos. The colors were mainly soft neutrals and browns. I also spotted very elegant suede cavalier boots that made me rethink the whole idea of wearing boots year round. AUTHOR was another cool shoe boutique. In addition to a good selection of oxfords by a brand called Hudson there were flirty vintage looking canvas wedge espadrilles trimmed with buttons and grosgrain details. Check them out at www.authorshoes.com. Both retailers have locations throughout the city as do most of the other big names like TOP SHOP, H&M and ZARA. (At least their merchandise differs from what is sold in the States). Moving on to some of my personal finds, there’s a terrific boutique on regent Street called COS. Reasonably priced ladies and mens sportswear offered a clean Michael Kors/Helmut Lang sensibility with a bit more youthfulness. Camel and yellow combos were the big color trends (a look I don’t usually go for but here they worked). As far as fashion trends go most stores were filled with short versions of the basic trench coat, lots of variations on the classic navy/white sailor striped top, ‘70s inspired jumpsuits and fun prints combined with shots of bright coral, navy or black/white. HOBBS managed to get the ladylike look perfectly with some fabulous bright spring coats, darling little cardigans and pretty printed blouses, all at less than bridge prices. Their shoe selection was also worth checking out. See what’s new at HOBBS.CO.UK/NW3. I also spotted another gorgeous, navy coat piped with ivory grosgrain (think ‘60s chic) at WHISTLES, another long time fave boutique in the same price range as Hobbs. In all the years of shopping in London, these two stores never fail to impress me with their affordable fashion savvy looks that are always on trend without going overboard. I skimmed through Harvey Nicks accessory and shoe departments without spending a penny, followed by a quick tour of Harrods to pick up one of their famous signature shopping totes (my concession to touristy kitsch). Naturally, this area of the store was jam packed with other tourists (mostly Japanese), also eager to grab anything with the Harrods name on it. On the whole the department store or at least the ground floor looked like a combination of ancient Egypt meets Las Vegas kitsch, combined with 1920’s Hollywood schlock. Only the princess Diana/Dodi tribute fountain was moving and sweet. We skipped the overpriced food-halls and instead went across the street to our favorite Italian restaurant ZIA TERESA at 21A Hans Road for a cozy meal that didn’t break the budget. (you know the food’s good when the place is full of well dressed Italians). And while we’re on the subject of food I must mention a charming Chinese restaurant at 35-36 Greek Street called Y MING. Intimate setting combined with refined food made for a terrific combo and the location is perfect for theatre goers. I don’t have a sweet tooth I have a sweet mouth so naturally I seek out the best places to satisfy my cravings. Top of the list goes to RICHOUX a restaurant on Piccadilly (also on Brompton Road) that makes the world’s greatest pastries. The chocolate covered cheesecake is beyond compare – and I don’t even like cheesecake all that much. But I digress. You want to know about the fashions. Interestingly enough I found the best stuff on three ‘famous” streets that I usually don’t expect would carry anything but the most boring and/or expensive items. On Sloane Street it was love at first sight at PRINGLE of SCOTLAND. Forget the notion of dowdy basic cashmere sweaters. In its place was a capsule sweater collection designed by Tilda Swinton. Gorgeous! 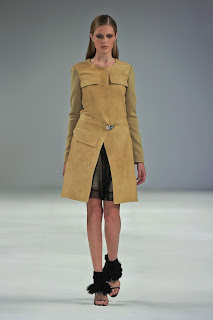 In addition I drooled over the fabulous RTW, especially the intricately constructed leather kilt skirt with oversize patch pocket and the leather kilt coat with knit sleeves, both in a soft camel color. Meanwhile my friend was also mooning over the equally fab menswear collection. Find out more at pringlescotland.com. Moving on to more affordable price points I headed to the Kings Road where I spotted a very preppy boutique called JACK WILLS. If you like that Eton/ Oxbridge look this is the place to shop. I zoned in on contrast piped shrunken blazers and chunky crew neck sweaters in white or pastels. The store caters to both sexes so check them out at www.jackwills.com. Farther up the road we found an Oxfam shop, the Brit version of Goodwill. Prices were allover the map but there was a very nice grey wool coat from well known brand Warehouse that was a steal at 12 pounds. Probably the busiest shopping street in all of London is Oxford Street. Between the sunny warm weather and the impossible to miss sale signs everywhere it was almost impossible to maneuver through the crowds. While most budget minded shoppers were heading to either MARKS & SPENCER or PRIMARK I went straight to HOUSE of FRASER’S new BIBA boutique. Since I was a huge fan of the original way back in the late ‘60s and ‘70s I was thrilled to find that it had been brought back to life. Down the road there are plans to include expanding into makeup and perfume but for now it’s the accessories that are driving sales. I opted for a gorgeous bone leather cross body handbag and change purse in muted green – both with the signature Biba logo hardware. If money hadn’t been a major factor I would have also bought one of the striking wide gold cuff bracelets or the dainty Art Nouveau inspired necklaces. All things considered Biba’s prices for leather goods compared much more favorably than some of the designer bags I see here, plus I won’t see myself coming and going, ha! Talk about one-stop shopping. On the same floor I spotted the TED BAKER brand of whimsical bow trimmed plastic totes in bright red, hot pink and black white. Moving on I spotted the WHISTLES RTW collection. If I had an occasion to wear it I would have bought the elegant crepe jumpsuit in a black/caramel tiny abstract pattern. Lest you think that all I did was shop I’m here to tell you that I hit the Victoria and Albert Museum’s YOHJI YAMAMOTO fashion exhibit. This installation-based retrospective was his first major solo show in the UK and showcased over 80 garments. Naturally I had to make a pit stop at the museum gift shop where I picked up some fun costume jewelry and gifts for friends and relatives. The exhibit runs until July 10th and it’s definitely worth a visit. Speaking of jewelry I happened upon TINGS JEWELERY BOX stall in the Piccadilly Flea market. I found some terrific buys on vintage Deco rings and pins. Check her out at hutinghughes-@-hotmail.com.There were other vendors selling antique costume and fine jewelry and other fun items. If you must hit the major flea markets make GRAYS ANTIQUE MARKET at 1-2 Davies Mews your first stop before you hit Portobello Market. Surprisingly, I didn’t see many vintage stores and the few I did find weren’t worth the money. The one exception was MARSHMALLOW MOUNTAIN at Kingly Court (off Carnaby Street) where the prices were low and the selection was varied. Shop online at www.stores.ebay.co.uk/marshmallow-mountain. One last tip. If you’re planning a trip to London be sure to take the tube from Heathrow right to Piccadilly Circus and be sure to get an Oyster card. This will save you big bucks on bus/subway travel. All in all, I found that London wasn’t as expensive as I expected. That’s it for now. Cheers! C&C.